Nessie on the Allies Side! During World War Two, even the Loch Ness Monster was not immune to the propaganda of the Axis powers. Previously, I had written of a Nazi Germany April Fool about Nessie being captured and displayed in Edinburgh in 1934. Not quite wartime propaganda, but Goebbels went to war on Nessie in 1940 with a dismissive article about the monster being a tourist trade scam. So now you know how to answer in future when anyone asks you what Nessie debunkers and Josef Goebbels have in common. I also mentioned the Italian spoof about one of their bombers taking out Nessie in 1941 and cryptozoologist, Paul Cropper, sent me further details from this article from "The World's News" of Sydney dated 22nd November 1941. I love the picture of patriotic Nessie cocking a snook at the Fascist plane as its bombs miss her! Of course, the article is not going to reveal much about the identity of the Loch Ness Monster. However, since this blog tries to be holistic and seek out the folkloric, historical and cultural as well as the analytical and scientific, then such newspaper clippings are always welcome. The good thing was that Nessie made a triumphant return with a sighting from the 18th August 1941 being reported in the Daily Mail. A Mr. MacFarlan-Barrow, his wife and three children were out in a dinghy when the creature broke surface near Glendoe Pier. It was described as having a long, snake like neck with 15 to 18 feet of body showing in the classic "upturned boat" fashion. For ten minutes, Nessie moved around before it disappeared half a mile from Fort Augustus. Whilst compiling the list of alleged Nessie carcasses, this one completely escaped my mind. Richard Carter was an active monster hunter back in the 1990s and found this skull on the shores of Loch Ness which then went through various hands before it seems ending up in a Yorkshire landfill site. Richard Carter no longer is on the Loch Ness scene, but in a recent exchange of messages with me, he still believes there is something unusual in the loch and is drawn to the Giant Eel theory. It is probably a cat, and I recall F. W. Holiday talking about finding a wildcat carcass during his shoreline searches. But it could be something else (though not necessarily mysterious) and does show that things are found around the loch, albeit not of a Nessie nature. It is a matter then of figuring out what exactly it is (I contacted Steve Feltham who was of the opinion it was a cat). The comments below are taken from a website on Scottish Big Cats. 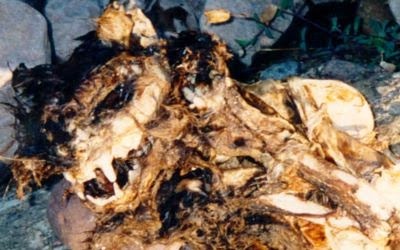 In February 1995, Richard Carter from Huddersfield, found, along the banks of Loch Ness, the remains of an animal that he could not readily identify. He gathered the bones and the skull, which reminded him of a large cat, because of its fangs. The skull he gave to Steve Feltham who later passed it on to Di Francis, the bones he took home to Yorkshire. Later he discarded the bones in the dustbin. It was two years later, in late 1997, when I visited Richard at his home. He showed me the photograph and told me the brief details. He did have a report made, which I think was by Rita Gould, although I never had the chance to see it. So thats it, but I would liked to have seen the picture without the decoration's around the skull. Also Richard would like to know what became of the skull? With regards to the Loch Ness photo taken by Richard Carter, the features of this skull were rather obscure. There appears, however, to be too many teeth for it to be feline. To me its canine. I tend to agree with Nigel that they could be of canine origin as the skull does seem to be some what elongated. The image is rather blurred and the skull is covered with debris making any sort of identification very difficult. However, if it compared to the skulls identification section, I would agree that it does look possibly canine rather than felid. About 15 years ago my dog found a large pile of seaweed on Winterton beach in Norfolk. It was a badly decoposed body about 8 foot long with (rotted bits it would be longer) very large canine teeth and jaws bigger than an alsation. I eventually made up my mind that it must be a type of sealion and left it to rot in peace. P.S. Your comments reminded another member of the group that he also thought the skull might be a seal. The Loch Ness skull: Other than the photographs on the SBCT website, little exists. In discussion with Di Francis at beginning of this year I had the chance to examine her collection of photographs first-hand, as illustrated in her books/ articles. She states the skull was passed over to amateur Loch Ness Monster hunter Steve Feltham, who then passed it on to her. She was ADAMANT the skull is only a "cat" be it F.cattus or F. sylvestris. Looking at the photograph on your site, behind the upper canine teeth are 2 visible teeth, whose size, both relative to each other, and to the length of the maxillary upper jaw show it to be typically FELINE. The premolars are huge in cats, with characteristics of size and shape, clearly seen in the photograph, albeit a poor quality one. Note, pinnipeds such as common seals, have short albeit very sharp, highly curved upper canines (cf photo - large canines, carnivore) and are followed by an array of premolar and molar teeth all very much the same in terms of size and morphology. I describe them as 'leaf' like, with 3 `trident like' cusps/spurs projecting above the gum margins. The photo shows what appears to be an ear, rounded pinnal cartiledge flap of tissue behind the bulk of the skull. Comparatively the skull appears domestic-wild cat. The almond shaped eye like slit is rather deceptive. Ocular cavities of domestic cats and grampus are HUGE, the eye of dead animals rapidly looses moisture and dehydrates or ruptures, the slit like opening - the skin concaving into huge orbits, typified by "small cats", but felids in general. Nothing I've seen of Loch Ness skull would convince me it is anything different from the 2 F.cattus/sylvestris skulls I have myself. PS. I asked Di Francis what became of the skull, but she couldn't remember at the time where its' location is.